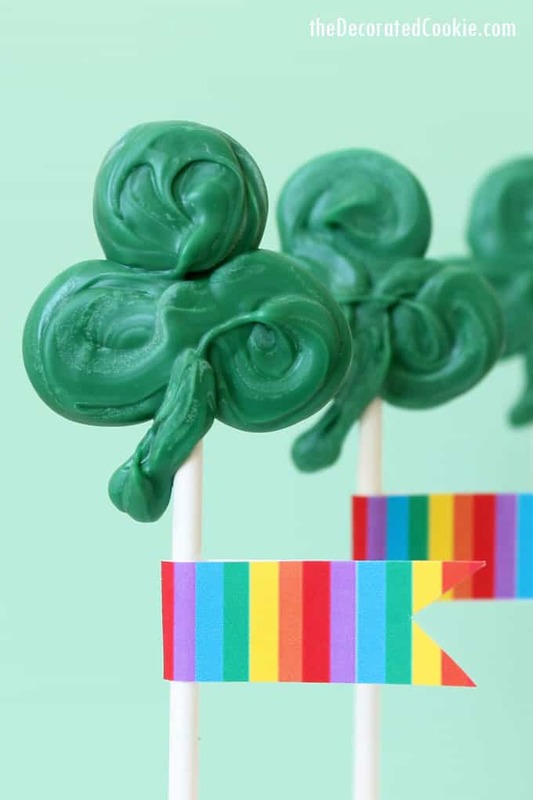 How to make simple candy shamrocks pops for St. Patrick's Day. 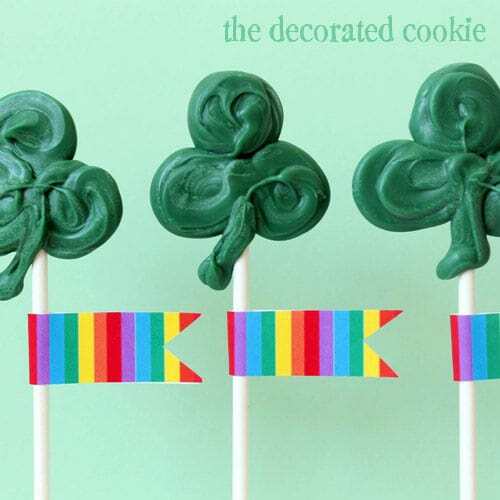 How to make simple candy shamrocks pops for St. Patrick’s Day. I’ve a good bit o’ Irish in me, but long gone are the days of heading to an Irish pub in the wee hours to spend St. Patrick’s Day. Now I would so gripe about the long bathroom lines, spilled Guinness, and kids today. The most nuts I’d get this year may be to have neighbors over for said Guinness. And maybe crock pot Irish stew. 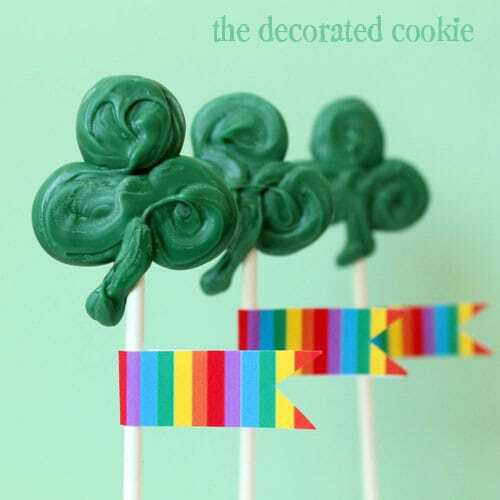 And super duper crazy easy St. Patrick’s Day candy shamrocks pops. 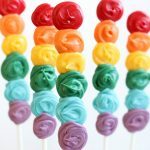 Melted candy on sticks is my go-to for everything. 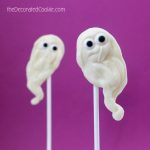 See all these monster chocolate pops from Halloween? 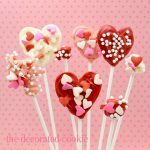 And it’s so easy, my kid helped me make these Valentine’s Day pops . A couple of weeks ago when Maeve’s cousins were over, we pulled out some baking trays, candy melts, lollipop sticks and sprinkles and they all made their own candy pops. Totally unplanned. Because that’s how low-stress these are, and I always have all the supplies and ingredients on hand. *Find the candy melts, decorating bags and lollipop sticks in the craft store. what to do: Line a baking tray with wax paper. Place about 1/2 cup of candy melts in a decorating bag. Microwave at 60 percent power for 90 seconds. Massage the candy and repeat at 30 second intervals until the candy is completely melted. Close the bag with a rubber band if you wish. Snip 1/4 inch from the tip of the bag and pipe a dot the size of a dime on the wax paper. 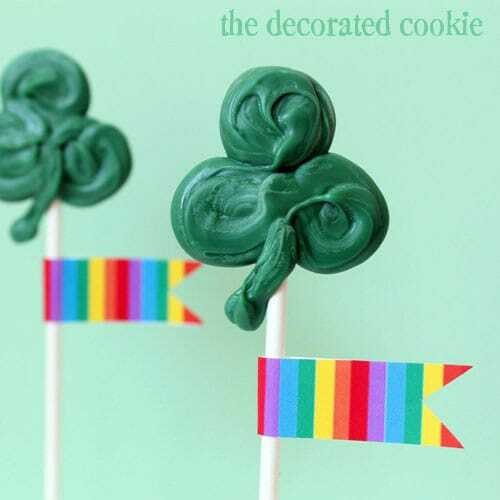 Place the lollipop stick on the dot of candy and pipe a shamrock on top. Repeat to fill the tray, using additional decorating bags and candy melts as needed. Let set well, a couple hours at room temperature or in the fridge. These are SO cute! I love the little tags too! 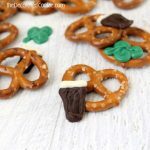 These are so sweet and a perfect treat for St. Patrick’s Day.